The long-awaited crossover between The Simpsons and Family Guy doesn't air until September 29, but Comic-Con attendees were treated to nearly five minutes of footage from the upcoming double-sized episode. So far, so brilliant. 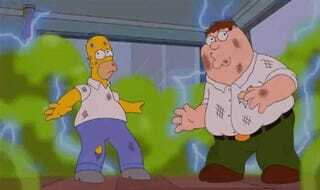 Long having been criticized as a darker, dirtier version of The Simpsons, Family Guy's visit to Springfield, Unknown highlights the differences between the two prime time dysfunctional family animated series. Nowhere is the difference as profound as during the prank phone call scene with Bart and Stewie. Bart calls Moe's to deliver one of his signature puns to the bar owner ("Is there a Lee Keebum?"). Stewie's attempt takes it in a much darker direction. "Hello Moe? Your sister's being raped." Damn. As with many episodes of both shows, the crossover uses animated comedy to tackle a real-world issue. It's just in this case the real-world issue is the differences and similarities between the shows themselves. Here's the whole clip, courtesy of Entertainment Weekly.